When I was a kid, Monopoly wasn’t so much about building up a property portfolio as it was about robbing the bank and striking secret deals with other players. Worse still, you knew who was going to win an hour before the game dragged itself across the finish line – something which was never fun for the loser. Me. Thank goodness games have evolved. As I’ve eluded to many times in the past on my blog and on Facebook, I love table top games – dice, board and card games. They’re a great way for families to communicate and laugh together, and I really enjoy the idea of encouraging others to try them out. In fact, Big Family Little Income and The Goof Review are putting together a local event in Gympie next month for people to come along with their kids and try some of our family’s favourite games – but more on that down the track. Z-Man Games produce some of our family’s favourites – Pandemic and Stone Age – so a month ago I took a punt and contacted them to see if they’d like to give a game away on my site. Rather wonderfully, they said yes. It was very exciting. They asked what game I had in mind and after looking at their extensive catalogue I told them I don’t care. They could choose. Then their package arrived in the mail. I tore open the package and pulled out the game they’d chosen: Thunder & Lightning. For about ten seconds Master24 and I just stared at the box with grins affixed to our faces. “I’ve never heard of it,” I said to him. This is the bit I love about this table top gaming resurgence – unlike when I was growing up there are so many good games out there to discover. Proper games which require more than luck to win. More than simply being older than your opponents. Which do more than encourage kids to cheat and pass fake money under the table. 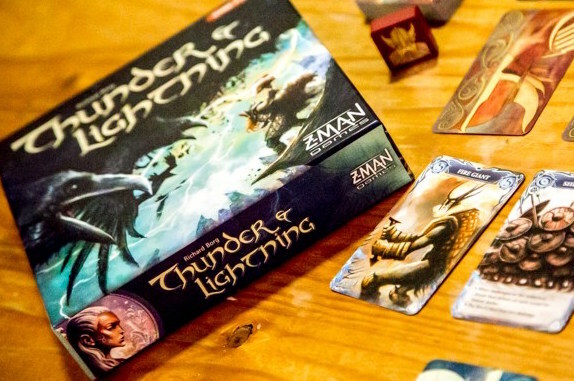 Unlike a lot of family games we play in the house, Thunder & Lightning is strictly for two players. For our family, this can be a problem because everyone wants in when we’re having a gaming night, but for smaller families it’s just about perfect. The other consideration is it’s for ages 13+. Again, this doesn’t suit our kids, but it does mean Master24 and I have a game we can enjoy together as we unwind when the littlies go to bed. Now it’s confession time. Even after Master24 found some very positive reviews on this game, I had my doubts. In fact, I put off playing it for about three weeks, with my oldest boy eventually enticing me to the dining table with a fresh cuppa and a small cheese platter. I very quickly forgot about the cheese. In fact, when he eventually insisted on going to bed so he could make it to work the next day I was disappointed we were packing it up. Thunder & Lightning is a great game. Already one of my favourite games. How much do I like it? The following night I caught Master24 and his girlfriend playing it and I was actually a bit jealous. It’s mechanics are simple to understand and strategies are fun to play around with. Plus the artwork is beautiful. And why other gaming companies can’t see the value in quality card thickness is beyond me (you’ll understand the more games you play). What is your favourite board or card game, and why? Entries close at 10pm on Sunday 25th September, with the winner announced shortly afterwards. Terms & Conditions. Master24 did a review over on The Goof Review if you want to check one out a – Thunder & Lightning review. Favorite game? Just 1? I’d have to pick Star Flux. Star Flux is a card game which gets better with more people playing. I love it because the rules can change with each player’s turn. The game itself is ever changing and never the same twice, hence the name of Flux. It’s a lot of fun and full of ways to steal a win from a player who thinks it’s in the bag. Deviousness is an important skill for this game. Our kids were able to master the rules of play and understand the twists and turns from age 7. Great family game. Rat a tat Cat, Cats, Rats, memory skills and completely addictive. The best game! I love that it’s our own little “date” time. My favourite is Settler’s of Catan. We make up different variations to keep it interesting. Our kids favourite is “Hungry caterpillar”! They are 2 and 4 and quickly learning to love board games as much as we do. Even if we have to remind them every time it’s their turn, that it’s their turn, and we end up hating the sound of our own voices. They also love the kids version of charades. It is HILARIOUS and adorable to watch a 2 year old act out an unrelated action and then yell out what the card was anyway. My grandparents taught me a card game they called pack a poo. I was quite young at the time so I found the name rather amusing. I am looking forward to being able to teach it to my kids one day. Our favourite game? Just one you say? Gosh let’s think about this – might take all day! Or cluedo where White’s murdered in the tub? Or guess who? – I am the champion! Don’t wake up dad! – now that’s a winner. A nice quick game to play before dinner. Card games – now they are fun. Red sevens or skipbo where you need a run. If you see a crocodile don’t forget to scream? Or empire – miss out on money if you daydream. No, it would have to be Payday! Now that’s a game we could play all day. Cluedo! I bought the kiddy version to play with my 7 year old and then decided to take him straight to the full version because who can resist trying to guess if it was Miss Scarlett in the Library with the Candlestick or Colonel Mustard in the Conservatory with the Spanner?! I like UNO, because no matter whos about they know how to play and can join in quickly! oh and Rush Hour…….for when you want to play alone! Good old classic Memory! Loved playing as a kid and still love it now. I enjoy the challenge of trying to remember where that damn one is that everyone is trying to find!!!! My, or our, favourite game has to be scategories because we laugh ourselves silly at the “wrong” answers and everyone can win when we take turns at being the referee so that the wrong answers become right and creative thinking no matter how outside the box gets rewarded. Taboo, cause it’s hilarious, even before the fart sounding squeaker gets used. We have started playing 5 crowns and yes it’s a card game! Recently our clan got together and we all played – the youngest 17 and the oldest 74! We all loved it although being flogged by your 17 yr old son was not the best but the winner changed over the many nights we gathered around the table. Normally we don’t see the 17yr old out of his bedroom but he loved it – any age can play and it’s great fun! Munchkin!!!!!! So many expandables that can play in with each other. Great humour combined with simple but hilarious pictures. Plus i love the munchkin side of interpreting the card in a different manner and convincing the others that it is ligit! Easy enough game to learn and great for if you have a role playing mind. Hopefully Dead of winter a crossroads game. I bought it for my husband for his upcoming birthday based on your sons review. Can’t wait to try it out. We love Sequence, card and board game in one! Easy enough for the kids but also challenging for the adults. 52 pic up.. they might even clean up othet things off their floor. It’s an oldie… I love playing uno with my kids. We have the frozen edition to please miss 5. It’s great for teaching kids colours, numbers and how to take turns. Great for the little ones with a short attention span. At the moment, no power in the ‘verse could beat Firefly Fluxx in my eyes…except maybe Cards Against Humanity! We also are a game loving household. Our family favourite to play with Miss 6 & Miss 4 is Zombiecide. Miss 6 is a little zombie killing machine and has proven time and time again that I’d want her on my side in a zombie apocalypse and Miss 4 gets in in the action by playing the part of the Zombies. I mean who doesn’t love a family that sticks together to kill Zombies – well 3 of us anyway the other is out to get us. Oh the games! We are a gaming family, with kiddies (6, 4, 2) we thought we’d have to slow down on the gaming front. Nope. Of course the kids love it just as much as we do. We love them ALL. A weekend of D&D, pandemic, House on the Hill, chess, monster cafe, dragonwood, and our family favorite Sleeping Queens. Any game that can keep the interest of our entire family is a winner in my eyes. Hmm it was Carcassonne until my sister got really good at it, now there’s no point even playing against her. At the moment my favourite with my class is Articulate Junior because it’s hilarious hearing them try to describe the words to each other eg “it’s round” and then being so frustrated that no one can guess that they’re talking about a water tank. I also like the new Monopoly Empire. It’s quick and quite ruthless…not good to play with kids lacking resilience, but super fun! We didn’t playtest this at all and its expansions (we didn’t playtest this either, we didn’t playtest : themes, we didn’t playest this : legacies). Fast paced, no rules, hilarious cards (make everyone say ‘comic sans is awesome’ before every turn if you’re an evil person) highly recommend!! Living in a small country town in rural Victoria means that game choices are limited and finances mean that online choices are not always an option. So our family tends towards the classics like Uno, Monopoly, and Cluedo. But when the whole family get together the cards come out and we have great rounds of 500 and Presidents & Mongrels. My kids are starting to get older and I’d LOVE to be able to introduce new games to family time. The kids an I love playing Zombicide together, especially the new Black Plague version that arrived recently from Kickstarter. Mine would have to be discworld: Ankh Morpork. Its based on The city of Ankh morpork from Terry pratchets Discworld series. I like it because in playing the game you have to get dirty with how you play (without cheating) as the game is about sabotaging each other by assassination, stealing money and trying to stop other players from winning. Its a pretty awesome game and once you get the hang of it you can get a few games in because the longest amount of time playing is about 1hr. My favourite boardgame’s gotta be the Firefly boardgame…. despite the fact I can NEVER win. When the board is laid out with all its expansion packs, it’s over a metre long, with so many colourful characters, tools, and missions all over the ‘verse… but my wife ignores that, takes her under-manned, under-equipped crew on her rusty spacebucket and relies on brute luck and repeated dice rolls to win EVERY TIME… except when we play with the Pirates and Bounty Hunters expansion where I can make her measly pea-shooter-armed crew suffer. Guess which one stays in the box most times we play? My husbands family have a card game called Muggins. It’s great for playing with kids. The winner wins, the loser wins, and you get to yell “Muggins! !” when anybody makes a mistake. I don’t know who invented it, but the cards were handmade by my husbands grandfather about 60 years ago, so they are time worn and wonderful. My dad and brother introduced me to Dominion a few years ago, and I loved it. Finally bought some cards of my own this year and taught my 13, almost 10 and almost 8 year olds to play, despite dad being very skeptical about their ability to play strategically or even follow the gameplay. It is super easy to alter the starting cards to handicap players based on ability, but it didn’t take too many games before that became unnecessary. The youngest beats me quite regularly >_< I'm going to have to get more expansion packs to slow her down! Our favourite game at the moment is Marvel Legendary, because it’s a different game every time you play it! The art work is AMAZING (as you’d expect from Marvel), the characters and their attributes are AWESOME, and the game can be played by up to 5 players. You can even play alone against the game! I love that it can be purely a team game, or as individuals. We now have 2 base games and 4 expansion packs, and are always on the lookout for more! Thanks Bruce. I have loved reading everyone’s comments and got some great ideas for games to try. To add some more ideas to the pot (it’s impossible to choose just one) Hive is a great 2 player strategy game. Our family also love Blokus, Carcassonne and Sequence at the moment. Chess, Monopoly and Uno are still popular classics in our house, and the kids loved playing Quoridor Junior and Rat-a-Tat-Cat when they were younger. It has to be MouseTrap! I used to love that game as a kid. I think I got more enjoyment over setting it up than actually playing it. Cards Against Humanity…can be so inappropriate but hilariously funny!! Magic the Gathering is big in our house at the moment. I love that it can be played with just two players or all 5 of us can join in a massive round table game. Miss 7 is quite ruthless and will attack anyone and everyone. She thinks it’s hilarious to gang up on me with her sisters. I need a better deck! It’s got to be Cards Against Humanity. So wrong on so many levels. Once you’ve played it with your parents you can never look at them the same way again! My favourite game is chess because I use to play it with my grandfather when I was a young girl, we would play for a couple of hours before my grandad would usually win, although I would win a few as i got better at it. Now my two young sons play with me which really gets their brains thinking and teaches them patience.